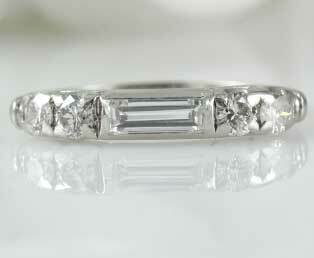 This fiery estate platinum baguette diamond wedding band is absolutely stunning. Center stage is held by a long baguette-cut diamond that appears to reflect light from every possible angle. Flanking this center diamond are four radiant, white round diamonds. This well made and sturdy band is made in platinum. Platinum is known as the true white metal and the metal is loved for being durable.